FREE printable packages include 5”x7” table signs, 3”x4” foldable tent cards, 4”x5” favor bag toppers, 2.25” circle cupcake toppers and 2.25” circle “Thank You” tags. Packages include 5” x 7” table signs, 3.5” x 4” foldable tent cards, 4” x 5” favor bag toppers, 2.25” circle cupcake toppers and 2.25” circle Thank You tags. Spring celebration ideas, tips and recipes from the jelly bean experts. Keep the fun rolling for National Jelly Bean Day on April 22, Mother’s Day in May, plus all the birthday parties and showers inspired by the flavours and colours of Jelly Belly beans. By the bouquet or by the bite, cake pops have never been sweeter or easier. A beautiful addition for spring celebrations, showers and parties. 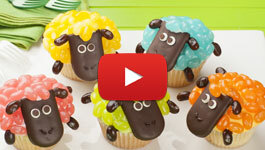 Fun for DIY favors, Easter, Mother’s Day, dessert parties and potlucks. DIY wreath made with single flavors of Jelly Belly beans will entice the Easter Bunny to your door. Check out the tutorial for the step-by-step instructions. Light bites of salty and sweet inspired by popcorn drizzled with white chocolate. Stir in one flavor of Jelly Belly beans or a favorite flavor collection such as Tropical Mix, Fruit Bowl or Smoothie Blend. Surprise guests with Jelly Belly jelly beans hidden inside a white chocolate ball. To make party favors, fill small cello bags about one-inch deep, top with Surprise Ball, tie closed with ribbon. Fun for Easter, party favors, baby showers, sweet sixteen birthday parties. Bake these adorable cupcakes and add Jelly Belly® jelly beans to make colorful creations for the spring. Use your favorite box mix or a homemade recipe. 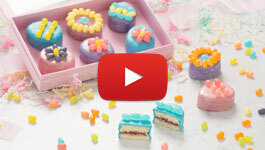 Treat the family to these delicious Easter-themed small cakes. Add a personal touch by decorating with your favorite Jelly Belly® jelly beans in spring colors. Use your favorite box mix or a homemade recipe. Share the love this season with Jelly Belly Kids Mix jelly beans. 20 true-to-life flavors kids voted they liked the best, all in one bag!